Strong relationships are built on mutual loyalty !!! Loyalty begins with your own self. Be loyal to yourself, to your feelings, desires and demands of your soul. Start by following a small dictum- “Do unto others what you wish to be done by (others to you)” and you will realize how clearly you can see and how simple your life becomes. It’s a double edged weapon, you will set standards for your behavior with others and will expect no less from them either; it will also make you reasonable as well as realistic because you won’t expect the moon from others while you are not ready to do even half as much. In the past you may have bent backwards to please others, moulded yourself to suit their needs because you were too meek to stand up for your own self. You never thought of self love, your desire to grow and attain self fulfillment. Not anymore. 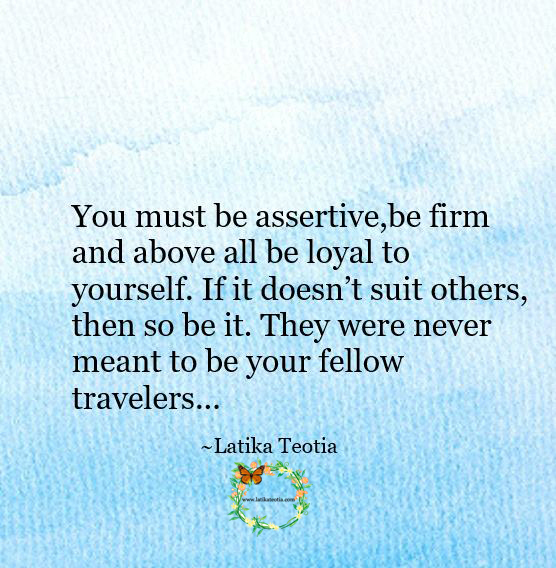 You must be assertive, be firm and above all be loyal to yourself. If it doesn’t suit others, then so be it. They were never meant to be your fellow travelers, they were like parasites who only wanted to use you, and having done that discard you when you had served their purpose. There was no ‘mutuality’ about such relationship.